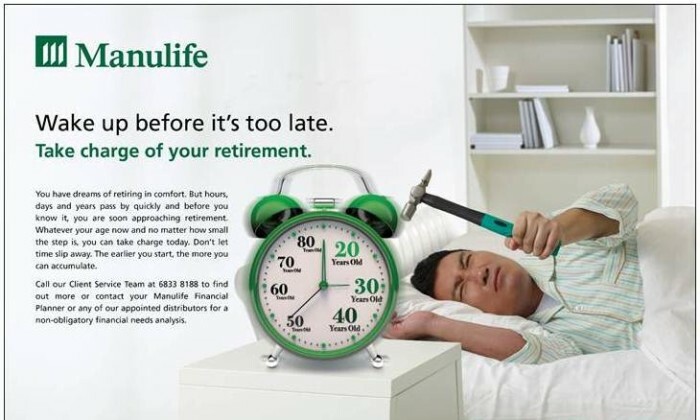 Manulife Singapore has commenced a new campaign looking to motivate Singaporeans to take control of their retirement. Created to combat the most common behavioral issues, errors and misconceptions about retirement planning, the data used to develop the campaign is obtained from survey results from Manulife’s Investor Sentiment Index (MISI). The findings revealed that many Singaporeans regularly procrastinate retirement planning due to other priorities and a lack of urgency. However, the survey also indicated that some were aware of the discrepancy between their savings and expenses, but simply chose not to act in the hope that their situation would resolve when it was time for retirement. 1. Build Your Wealth – make your money work harder for you so as to keep pace with inflation and build your retirement nest egg. 2. Protect Your wealth – protect your retirement savings from rising medical costs as you grow older. 3. Enjoy Your Wealth – set up a steady stream of income so that you can enjoy your golden years without outliving your resources. The campaign’s focus will be on content marketing, with print, digital and video expected to be extensively used. With an aim to educate consumers through informative content, the campaign will attempt to demonstrate to consumers that they can benefit from Manulife’s expertise in retirement planning. Notably, Manulife Singapore has joined up with online news portal AsiaOne to reach out to Singaporeans in more ways. With opportunities such as online resources (articles and videos) and a question submission portal, interested netizens will have the chance to improve their financial knowledge about retirement planning. Additional resources provided by Manulife include the online Retirement Calculator, available in English and Mandarin, which can be utilized by consumers to learn of potential gaps in their planning and finances. To encourage early sign ups for their retirement planning program, Manulife is offering a limited promotion during the campaign period. Those who register for the plans between July 1 and September 30 in 2015 can potentially win cruise vacations and shopping vouchers in addition to receiving major discounts. Can Asia bridge the skills gap for marketing analytics talent? Most of us have probably only ever interacted with a teller or relationship manager at the bank - and yet one can't help but wonde.. The tender briefing will be held on 4 September at 9.30am and it will be conducted only once, said HPB in the tender document. ..